Got this magnet from the Essilor booth at the Live Your Vision Pavilion - they're Definity Fairway Transitions SOLFX Lenses, which apparently is a golfer's best pal. 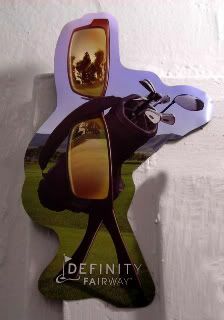 The magnet was packaged with a T-shirt, as a giveaway for making a putt. Dudes, I was so excited to see one of our partners giving away magnets, it was kinda like last year, when VSP gave away theirs! What? Thought I'd share, since I'm spending some of the weekend reviewing the telecast of the Transitions Championship from a branding perspective. Because that's what we do. Mind you, I'm not a big golfer, so as I'm watching the telecast, I'm hoping golf knowledge soaks in through osmosis. Bogeys, Birdies, Eagles, 8 irons, 9 irons, hooks and shanks, and how to tell whose balls are whose, the whole shebang. The ball thing I'm very confused about, only because I really don't understand how people know whose balls are who when you come up on the green. It's not like they all run out there and put down those chippy things right after their shots. They have to walk over there, don't they? And when they get there, how do they know? Do they have people watching all the greens, and do those folks tell the golfers which ball is theirs? And, if you're just a regular golfer, golfing with the guys, how do you know which ball is yours? Do they Sharpie their names on the balls?